Here are a few places I came across during this trip, beginning with this natural-wine bar in Shibuya. The area is just a stone throw from Hachiko crossing and you feel like in an other age, with a couple of alleys along the railroad tracks, it's some sort of Piss Alley like the one near Shinjuku, just smaller and less crowded.I was tipped about it by John but had completely forgotten and it was a colleague of Terumi, our friend in Tokyo, that pointed to this place after failing to find another venue in the area that had probably closed since last time he went there. He was looking specificly for what Japanese call a senbero which means literally "getting drunk for 1000 [¥]", this amount being the equivalent of 7,5 € or 8,3 USD, this is the type of place I love in Tokyo even if the booze they pour is not of the highest quality. Finding at last a spot at the end of the counter, I was marvelling to have found such a gem of a tiny wine bar at such a close distance from the crowds going through the Hachiko crossing like human waves. I looked at the black board and the list was indeed very French an natural, with prices I'll consider very reasonable for Japan, even if the Yen was not at its lowest, glasses were mostly priced between ¥ 700 and ¥ 1100 (5,2-8,3 € or 5,8-9 USD) and I ended up choosing an Alsace Pierre Frick Riesling 2011 for ¥ 800. The other wines were a Champagne (¥ 1000), a Muscadet from the Domaine de l'Ecu (¥ 700), a Bourgogne Aligoté from the Domaine Chevillon (¥ 1000), a Bourgogne Hautes-Côtes-de-Beaune by Caroline Lestime (¥ 1100), La Lune (Loire) from Mark Angeli (¥ 1100), a rosé, Langhe Rosato by Donna Costanza (¥ 1000), a Bordeaux Côtes de Blaye by Chateau Roland (¥ 800), a biodynamic Rhöne red, Petit Ours Brun by Matthieu Barret (¥ 900), an Australian red La Syrah by Jamsheed (¥ 1000), another Australian, Jumpin' Juice by Patrick Sullivan (¥ 1200), and lastly a beer which was the most expensive thing here I my reading was correct : Gargery Ale (a Japanese brewery) at ¥ 1700. As you can see the bar is small but they do the right thing to keep these fragile wines safe, there's this small wine fridge that must be so important in the hot days of the Japanese summer. The young woman here speaks some English, she told me the owners also have another venue or wine shop named Cujorl (it's also in Shibuya, you'll find the map and access itinerary on their website), which is more roomy as you can guess. Bouteille has a Facebook page with more wines featured. Lots of wine pics also on Instagram. Next to the Bouteille standing wine bar you get this other joint named Curva, it's as tiny as the other venue and it is mostly centered on beers, cocktails and spitits. You can smoke in here, it's one of the things I view positively in Japan although I don't smoke, rules are pretty flexible and the boring, restrictive norms of the West don't seem to reach the small Japanese eateries. I'm pretty proud because I have discovered this venue by myself, Tenshichi is located in the Kita-Senju district, a red light district along a busy train station hub in the north of Tokyo where salarymen go in droves for fun after work. The area is a maze of narrow alleys with neons and lots of bars an restaurants. I've also seen occasionally young women trying to entice salarymen for what I think is special services, in short this is a neighborhood to let off steam after a hard day's work. I had spotted this place among the other bars and izakayas, pulling the hanging curtains to see what was going on inside I saw a square counter with only men in suit standing all around having their drink (large draft beers mostly) and eating who knows what, and the kitchen staff in the middle preparing the food and pouring the drinks. This was the salaryman watering hole, a tachinomi-ya (standing bar) like you can dream it, and not a single gaijin around (not that I met any in the narrow alleys either, Kita-senju being somehow off the beaten path). Like usual in these circumstances I kept walking because it was obviously full (it was maybe 6pm or 7 pm I don't remember exactly) after peeking through the curtains several times I dared ask (so to say, with my hands) if there was room for 1 person, the staff behind the counter waved their hands welcomingly and they found me a slot on the other side. That's the type of situation I love in this country, with a bit of assurance and confidence you can experience these authentic izakayas/bars where it's really fun to have a few drinks with some food, he some very tasty tempura. I understand they do the Kansai style for their tempura, and I asked some nihonshu (sake) instead of draft beer. The place had a great atmosphere and all these men were pretty happy, laughing and chatting with their buddies. I ended up chatting with the two guys next to me, this was great ! Of course I recommend Westerners to come here alone or maximum two if they don't speak Japanese. The price was very correct, like ¥ 500 for the nihonshu and maybe ¥ 300 for a couple of grilled meat sticks. I had a glass of nihonshu at Kaburaya in the same alley further down, a place which I visited last year is an efficient joint with a mix of Japanese izakaya tradition with modern fastfood technology including young waitresses taking your orders on wireless terminals. Food is dirt cheat too here with ¥ 80 a yakitori (0.6 € or 0.66 USD), another venue where you can drink and eat without being bothered by the bill. The attendance is younger, it's certainly less authentic than Tenshichi but still worth a try, it's easier to get in for a foreigner too. When the place is full you can have your order outside, which is nice too, the smiling waitress comes to take your order and brings the items right away. A few meters away there's another restaurant I'll call "table barbecue" (pictures on both sides) because everyone gets a portable charcoal grill for his yakitori and grilled meat. The name seems to be Senju Horumon izakaya, horumon being the generic name for pork chitterlings grilled on barbecues. When I walked in front of the place there was two guys outside having their grill with them. It's again something you will never see in our submissive health-conscious West (OMG all this smoke) with all these restrictive norms that killed the essence of authentic eateries. Sitting inside I watched now and then as the grease coming out of the grilling meat burst into flames and the exhaust ducts above the grill couldn't handle all the smoke, this was like if you picknicked in the open. I just got a nihonshu there, which came under the form of a smamm bottle resembling a miniature bottle of Alsace wine. Lots of young people in there. I think it should be pretty easy to get inside for foreigners as long as you're not too many. The table bbq will make a funny plus in your dinner party. Even the wildly futuristic electronic city, Akihabara keeps the tradition of the iconic Yaki-imo food trucks, here in the back street with all the small shops selling electronic junk. In the past these hot sweet potatoes were cooked with wood stoves on hand-pushed carts, now it's on small food trucks but wood or charcoal is still used for the cooking, basically the tradition is safe. For a mere ¥ 500 you get the ultimate street food, healthy and traditional. In the more trendy and chic Yurakucho-Ginza districts you still can find a cluster of relatively cheap eateries, they're located like often under the railroad tracks. This is certainly not as authentic as several of the venues I wrote about but if you spend time in Ginza it's worth a visit. 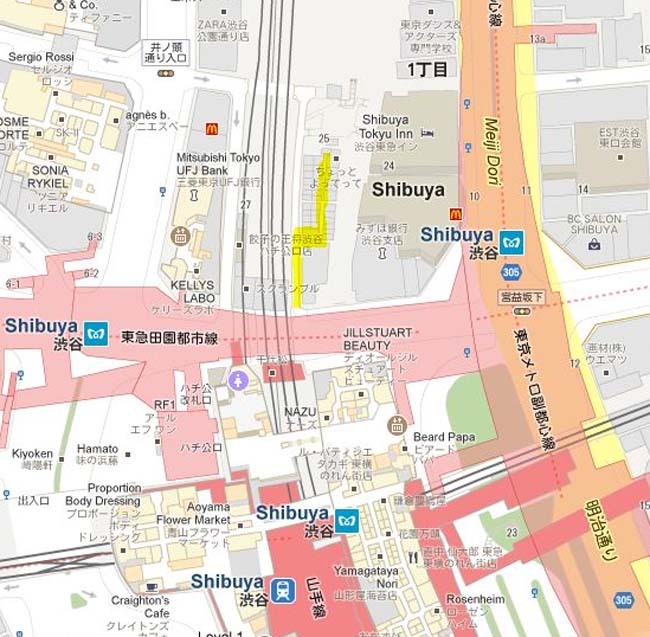 You find this place south of the Yurakucho station or east of the Hibiya station (see map here). Choose carefully your restaurant though as some may cost more than they look, you're not in Ueno, Ginza is much more upscale and chic. The area has of course more foreigners, the good side being you will not feel out of place if you don't speak Japanese. To be frank I almost never go to Ginza but after visiting this area under the railroad tracks I'll try to come back, there are many offices around there and office people like to relax after work, including with a good amount of drinking. My friend Terumi who brought me there works in the publishing sector in the area, she says the Tokyo city administration is worried that there is too much office real estate and there's a urban development project to build residential buildings in Ginza replenish the ranks of school children in the remaining schools that have trouble filling their classes. The company here is Kakuyasu (Yasu meaning cheap), here is a business plan that could be reproduced in France. Staying on the delivery man chapter, here is the Japanese equivalent of the iconic Indian dabbawala, the sophisticated system allowing office workers in Mumbai to have their lunch delivered from the home kitchen to their desk. Having watched The Lunchbox (the movie) recently I have a special thought for this asian cultural particularity which has no equivalent as far as I know in Europe. Here these bento boxes don't carry the home food but rather boxed dishes prepared by the catering company Watami Takushoku.Doing this delivery by bicycle makes sense, very flexible and low cost. This is not an outstanding place, on the opposite this is the typical familiy-owned venue with a feel of the old Japan. I called it for myself "Asahi Beer" as it's the only thing I could read on the front sign (Thanks to the reader Tokjdm who found the real name : Wakadaisho Matsushima). I found this poorly-lit, laidback restaurant in Ikebukuro, just on the limit of the red light district, on the street on the right when you come out of the JR station (West exit). When I pushed the door I just wanted an unsophisticated cheap joint to eat a bowl and rinse the whole with nihonshu. A sign on the window telling a bowl from the big pot on the fire was only ¥ 325 (2,56 € or 2,70 USD) made me decide for it. I sat at the counter to order more easily as I could point in the direction of the pot near the shop window, and I ordered some sake to go with that, it was priced also ¥ 325, all that tax included, it's a bit of a mystery but it seems restaurants include the 8 % sales tax when they post prices. The bowl was invigoratingly savoring, this was some sort of light soup with pork's intestines and a large square block of tofu, this made my dinner. I was asked if i wanted my sake (nihonshu) cold or warm (which I managed to understand) and I chose cold (room temperature) like usual; it was poured from a large 1,8-liter bottle. It's a good thing that a hectic neighborhood like Ikebukuro still has this sort of casual and cheap venue. Loved also the old-time radio station they were airing in there. This restaurant is located in the middle of the red light district at Ikebukuro, at a corner of the busy pedestrian streets with all the crowd of club/special services pushers with long coats trying to entice salarymen and day laborers indoors. Cheap sushi can be found here and there in Tokyo but this one is really what I'd call dirt cheap, with a sushi costing ¥ 75 apiece tax included (0,57 € or 0,62 USD). I think it may be a chain because I saw another similar restaurant elsewhere in town, another example of the fact that the restaurant scene in Tokyo is very diverse and that you can eat for very little. This is a standing sushi bar, in other words a tachinomi-ya, tou have a plastic menu in both Japanese and English, there . It seems to me that these sushi are smaller than in other places though, and they sell them 2 by 2. This is still a good way to have an appetizer and rinse it with beer or nihonshu. Here is the sushi menu, I remember choosing Yaki-Samon-Mayo, the trick is there doesn't seem to be much fish in there. The other suhi featured are not expensive either, at ¥ 100 apiece. A beer costs ¥ 500 and I think I paid my nihonshu the same price (oddly it's not listed on the menu). B. says that the fish certainly comes from dubious areas off the Fukushima coast... Let's say that I don't really believe it or I'm fatalist. This is a restaurant where you can have natural wines, it's French cuisine but basically you can come there just for the wine and order a small thing to eat with. I've not been there but it's said to be a serious venue. It's on a quiet side street from the one with the wine shop, easy to find I think. Here is the location map. This is one of the string of restaurants and wine bars that were opened long time ago by Hiroto Maruyama, one of the Japanese pioneers who introduced natural wines to the French public. A few meters down the same street with the wine shop (at the end of the street actually) you find Vin Vie, it's also a restaurant/wine bar owned by Maruyama, the venue is the whole 3-story building with the red roller blinds, there is a standing bar and also a terrace, I've not been inside either but I think it's worth a try, hoping the prices are reasonable. This restaurant seems to be recently opened compared to "Aux Amis", I hadn't heard about it before. That's the place B. saw inadvertedly a couple of weeks before my own trip, she couldn't get in because it was closed. The name "Vin Vie" is a reference in French to the living wines they pour there, the Japanese pronounce it like bambi as they have trouble uttering Vs.
Fin the map and directions here. Here is the tabelog profile of Vin-Vie. That looks like a bottle of Berthaut Fixin at Wine Stand Bouteille! The izakaya in Ikebukuro is called "Wakadaisho Matsushima"